The classic game with more ailments, new sound effects and skill levels to test your skill as top doc! For 2 – 4 players. Batteries required…. Surgery is a serious business; youll need skilful hands, steady nerves and total concentration! With your patient on the table, get ready to operate. Pick a card and remove the hilarious aliments with the tweezers, be careful not to set off the buzzer or you lose! 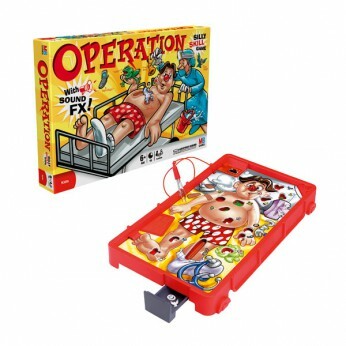 This hands on game really is a classic family favourite.Roll up your sleeves and grab your tweezers as you have a blast with the Operation board game.Steady hands and nerves of steel are key to winning this classic children’s game. Even sillier than before, this updated version has lots of sound effects and a ‘success button’ to reward the players who successfully remove the patient’s ailments without setting off the buzzer.The 13 ‘Funatomy’ parts can be safely stashed in the storage drawer to prevent them getting lost and the game has two different skill levels, making it easier for everyone in the family aged six and up to play. Opertaion needs 4 x AAA batteries, which aren’t included. This toy costs approximately £14.99 (for the latest and best prices make sure you check our retailer list for the Operation above). In our review of Operation we classed it as being suitable for ages 6 years, 7 years, 8 years but recommend you check the manufacturer specific advice before purchasing.